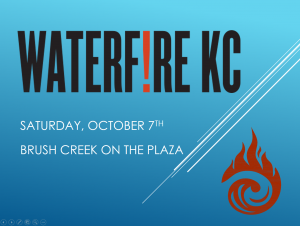 BE A PART OF WATERFIRE KC 2019! WaterFire KC wouldn't run without the help from our amazing volunteers. While the performance may only be for a few short hours, it takes multiple teams to help organize, set up, break down and run the show over a four day period. See below if you are interested in learning more about the various volunteer roles. If you already know what shifts you'd like to sign up, go ahead and click the 'sign in' link above. If you have not yet joined our volunteer team but would like to, click the 'sign up' link above. 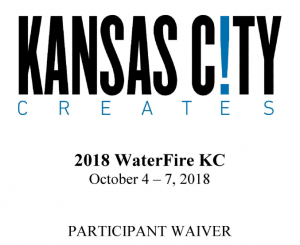 By signing up to be a volunteer, you will have the opportunity to not only lend a hand with WaterFire KC, but the multiple other productions run by Kansas City Creates, including: KC Fringe Festival, Inspire KC, and more to come! Our volunteers earn Creates Cash for working any of our productions and can use it to gain admission to various events as well as at our silent auction at our season end volunteer appreciation party! Brazier Team: Assembles our braziers on land. This is done in small teams, but you will be doing some heavy lifting. Brazier Society & VIP Staff: Hosts our Brazier Society patrons in the on-site tent, providing information, food, & drink, and assisting with their boat ride. Clean Up Crew: Helps restore the event area to it's pre-show glory. Fuse Team: Assembling fuses and fuel bags to serve as a base for the bonfires. Information Team: Serve as ambassadors to our public audience, greeting visitors and providing information to better their WaterFire KC experience. Marking Team: Working in a pair alongside Brush Creek, you will assist the boat teams in accurately placing the braziers. Merchandise Team: Sells WaterFire KC merchandise to guests before and during the performance. Street Set Up: Helps up to get the street and walkways prepped and ready for the evening by setting up tents and information points. Woodpile Workout: Volunteers will help set up our woodpiles alongside Brush Creek in preparation for the lighting. The health and safety of our volunteers and our public audience is our top priority. While we want to make sure everyone is enjoying their time with us, we need to be mindful of our operations and keep an eye out for each other. If you see something that you feel could become a potential problem or hazard, please let your team lead know so we can handle the situation appropriately. Due to a system error, our 2018 training is no longer available, the 2017 copy below contains the same important information. If you were not able to attended a training meeting, please take your time to carefully review this information as it contains more details about shift specific requirements. If you did attend a training meeting, feel free to use this as a review. Print, review, and sign a copy of the participant waiver found below. Please bring this form completed to your first shift. If you are not able to print this form, please arrive 15-20 minutes early to your first shift to allow time to complete the form. KC Creates must have a signed copy on record before you can start your first shift.